330 DUSTLESS BLASTING - Eco-Friendly. Fast & Safe. Cost Effective. Dustless blasting is environmentally safe and removes dirt, grime, grease, oil stains, all paint, calcification and rust from virtually ANY SURFACE – quickly and efficiently. 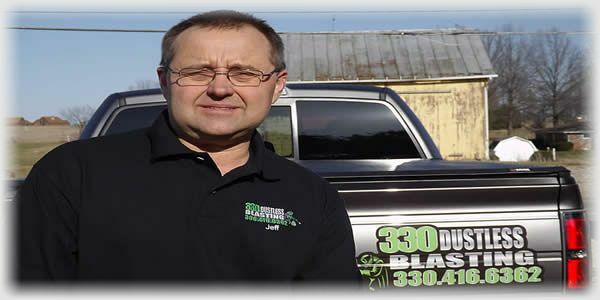 With over 30 years experience in the construction and masonry industry, 330 Dustless Blasting owner Jeff Komjati understands contractor needs, construction materials and logistics. – on-time, on budget, done right. Keep your heavy equipment and fleet vehicles in service longer, looking great, and easy to maintain with 330 Dustless Blasting. Removing rust and grime is eco-safe and affordable. 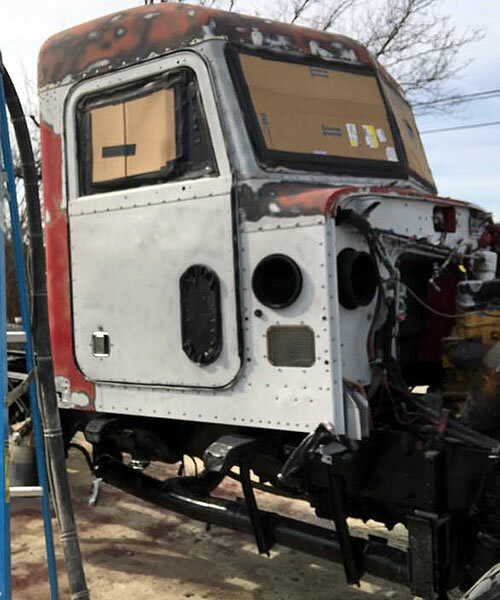 Surface preparation for fresh paint jobs and decals? That’s our specialty! 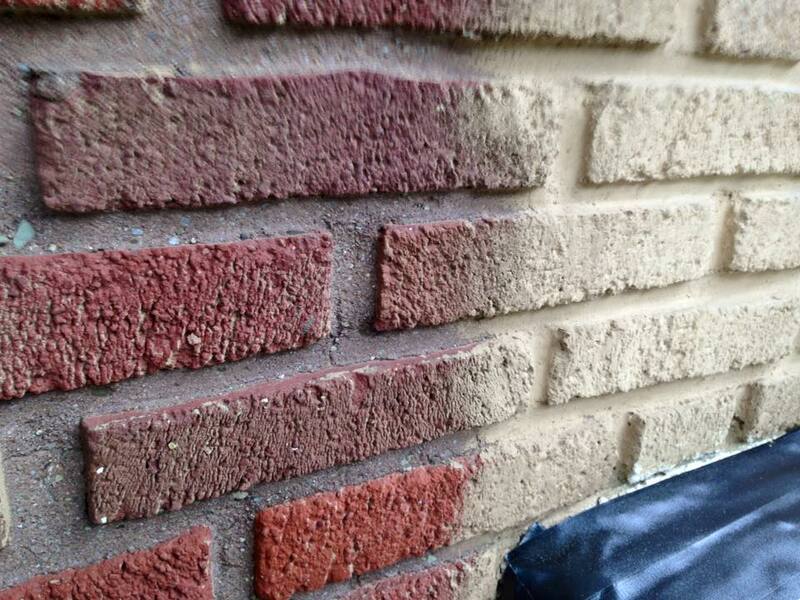 Dustless blasting doesn’t use heat, so there is zero warping, plus no waiting to apply paint. 330 Dustless Blasting is a perfect match for commercial fleet services & maintenance. 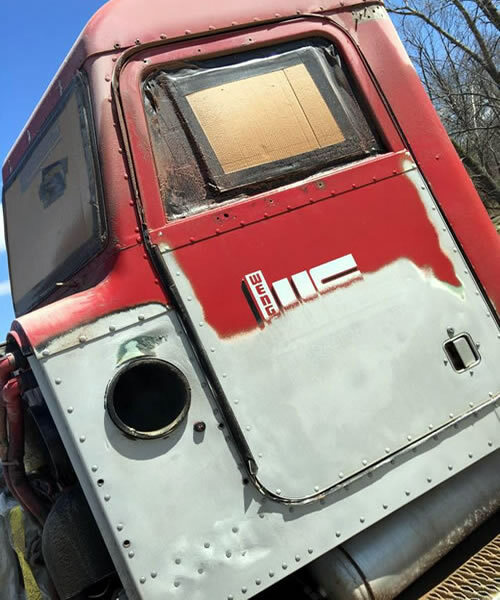 This efficient alternative to sand blasting easily handles rust, paint and decal removal from aluminum trailers, tractors, fiberglass hoods, flatbeds, and more. We also tackle decal removal quickly and easily with no damage to the paint or surface – no more peeling off decals and dealing with gummy adhesive. 330 Dustless Blasting removes paint and vinyl stickers all at once. 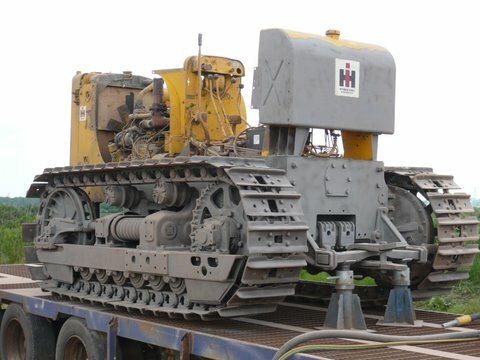 Heavy machinery (bulldozers, fork lifts, backhoes) usually features industrial strength coatings, difficult and time-consuming to remove with traditional methods. 330 Dustless Blasting is perfect for heavy equipment cleaning because it utilizes water, vastly increasing the efficiency of our system. 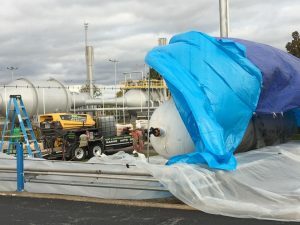 Water does not compress like air does, so our wet blasting process has more force than traditional dry blasting – and obliterates coatings specifically designed to be resistant to abrasion and wear. Dustless blasting uses recycled bottle glass – zero free silica, no heat, no dust plume, and is harmless to humans and plant life. Less hazardous to the environment, super fast and leaves a smooth surface, no matter what it is. Less messy too! Our Mobile Services come to YOU! 330 Dustless Blasting offers mobile dustless blasting services. 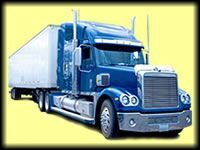 Our professional team will keep your fleet vehicles maintained and rust free. We show up fully equipped and ready to roll, working professionally and quickly, leaving only clean surfaces behind. Call Jeff at 330-416-6362 for Your FREE Quote Today. 330 Dustless Blasting provides effective industrial equipment cleaning and maintenance services. Throughout the industrial world, machine renovation rather than replacement is the most cost effective method of maintaining and even increasing productivity. Although industrial coatings are formulated to last, they are not foolproof and may need to be removed, along with rust, grime and other built-up materials. These can prove extremely difficult to remove completely with typical methods. In addition, both chemical stripping methods and sand- and soda-blasting bring with them their own problems. 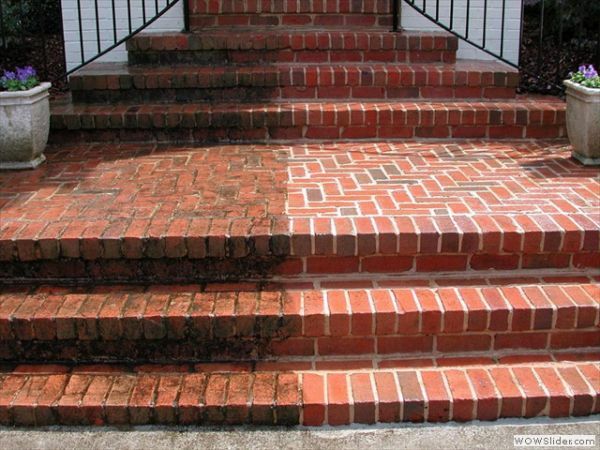 Paint removal from any surface. Rust or grime removal & cleaning. Dustless blasting is the most versatile alternative to power washing available. Perfectly safe for use around plants and vegetation, dustless blasting uses water and recycled bottle glass – zero free silica, no heat, no dust plume, and is harmless to humans also. Dustless Blasting safely removes paint from masonry and concrete, graffiti from building exteriors and rust from metals, making it great for home restoration of every kind. 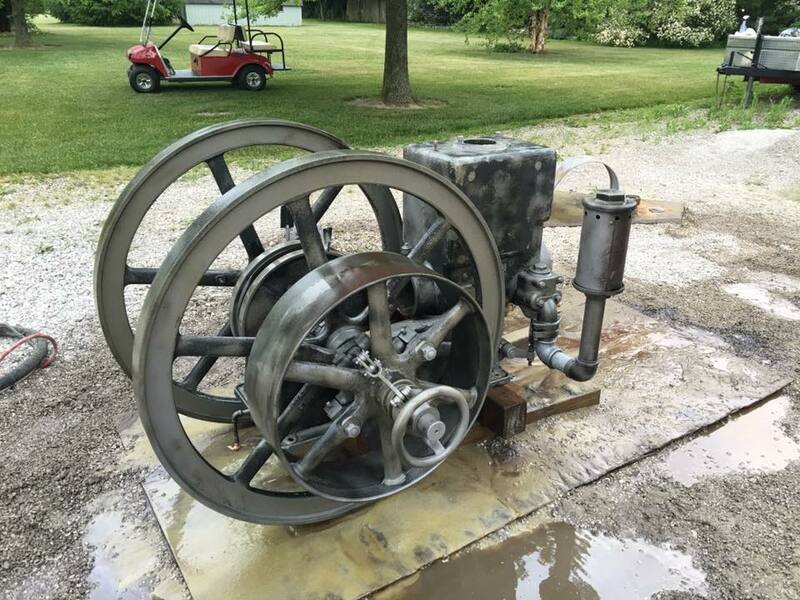 From restoring antiques to removing rust from fancy metal railings, 330 Dustless Blasting offers a safe, fast and easy solution that’s more effective and versatile than power washing alone. Our MOBILE service is self-contained, and arrives ready to get the job done! Commercial Dustless Blasting At Your Convenience! Our commercial dustless blasting services couldn’t get any more efficient! 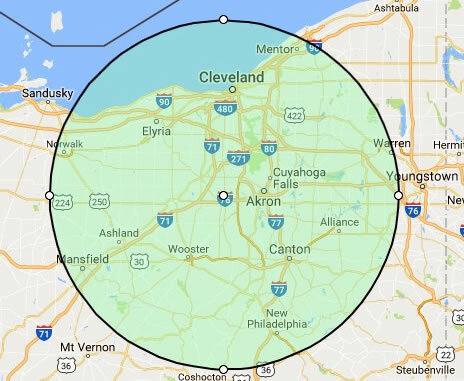 Serving Medina, Akron, Cleveland and surrounding Ohio communities, our mobile services come to your location. No need for disassembly or drop off and pick up. Dustless blasting is perfect for heavy equipment cleaning, industrial settings, machine maintenance and more. 330 Dustless Blasting is comfortable in the commercial environment. Having completed work for companies like NASA, Faculative Technologies, Ganley Auto, and Ohio Edison, we’re confident in our skills to get the job done efficiently, correctly and to your total satisfaction. 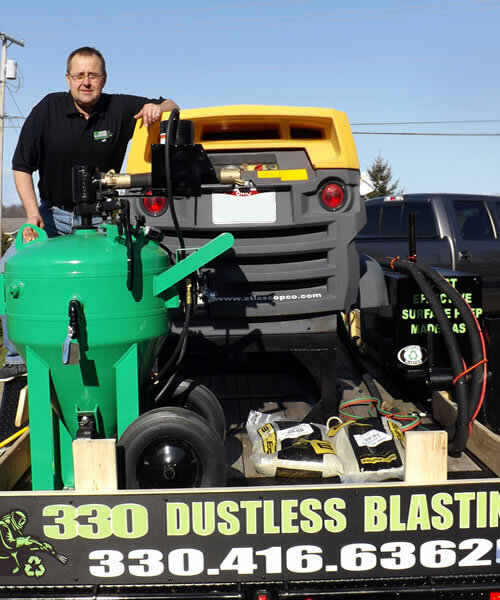 Why Choose 330 Dustless Blasting? NO heat, NO harsh chemicals EVER! Dustless blasting is a great automotive sandblasting alternative for paint and rust removal from vehicles. It is less hazardous to the environment and the operator, super fast and leaves you with a surface ready to paint ~ IMMEDIATELY! 330 Dustless Blasting offers mobile dustless blasting services. Our professional team will have your vehicle surfaces rust free and paint ready in no time right from your shop, garage or driveway. Dustless blasting uses recycled bottle glass – zero free silica, no heat, no dust plume, and is harmless to humans and plant life. A whole lot less messy too! There is no faster auto sandblasting alternative! Surface preparation made warp free and worry free: because dustless blasting uses water, no heat is involved allowing surfaces to stay cool, smooth and straight. 330 Dustless Blasting can help you with your next vehicle restoration! Looking for an easy way to remove stains, barnacles and bottom paint from your boat? Our mobile media blasting system offers an effective hull cleaning service that will remove years of marine-life and anti-fouling paint without damaging the surface – even on gel coat. No need for special containment – unlike soda blasting, dustless blasting uses recycled glass as the media. It’s environmentally friendly and won’t harm plant or marine life, water or air quality. 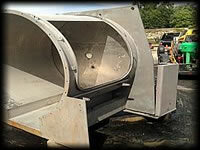 Dustless blasting is safe for steel, aluminum, fiberglass and gel coat boats. 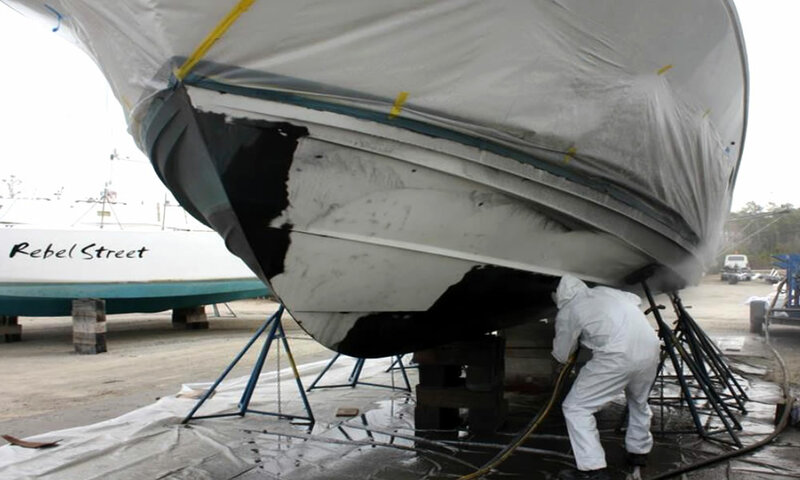 Once the blasting process is complete your boat can be winterized for storage or get a new coat of paint. Quickly & Conveniently At Your Location! 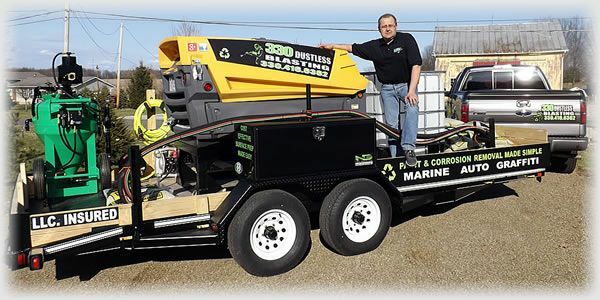 330 Dustless Blasting can also keep your trailer rust and crustacean free. 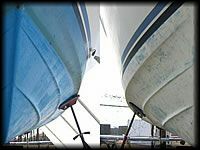 Call us today at 330-416-6362 for a free quote on boat cleaning or anti-fouling paint removal help today! Why Choose Dustless Blasting for Your Restoration Project? 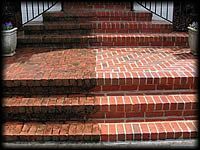 330 Dustless Blasting is the perfect surface preparation service for your restoration project. Whether you are looking to remove rust from metal, strip old paint, or clean years of grease and grime buildup, dustless blasting is a fast, safe, and convenient way to do it. ZERO chemicals, no drop off & pick up, and no waiting between blasting & painting! 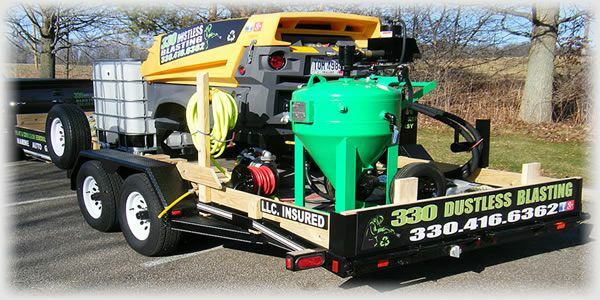 330 Dustless Blasting is a completely self-contained, mobile unit that conveniently arrives at your location ready to work an 8 hour day. 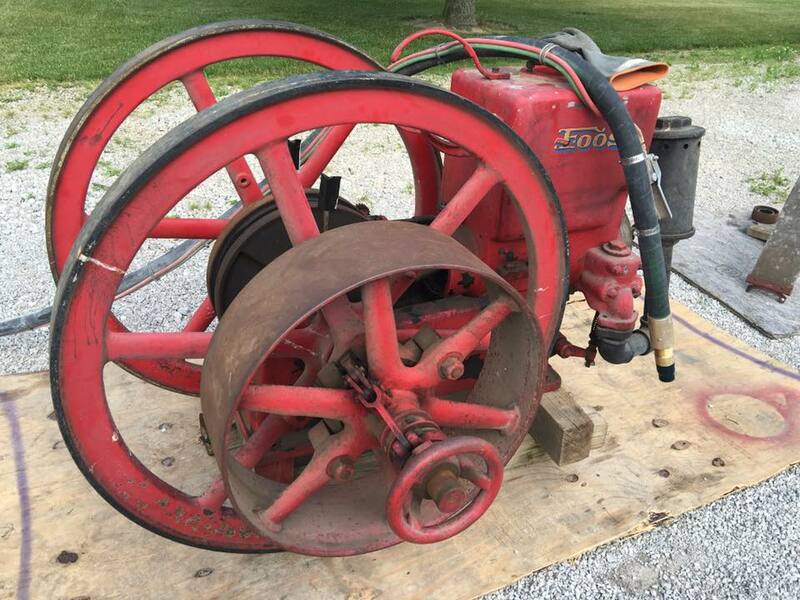 Our professional owner/ operator has years of experience dustless blasting many different types of projects, from airplanes to intricate and ornate antiques. Reduce your risk and protect your project by hiring a hands-on service provider who does the job right. I am rebuilding my 1980 Pontiac Sunbird and wanted it stripped so I could fix the metal work. I've seen Dustless Blasting demos on TV car shows and felt it would be a great way. I reached out to Jeff at 330 Dustless Blasting and he got back to me right away. We discussed the project & scheduled a time. He arrived Wednesday and set up his equipment. 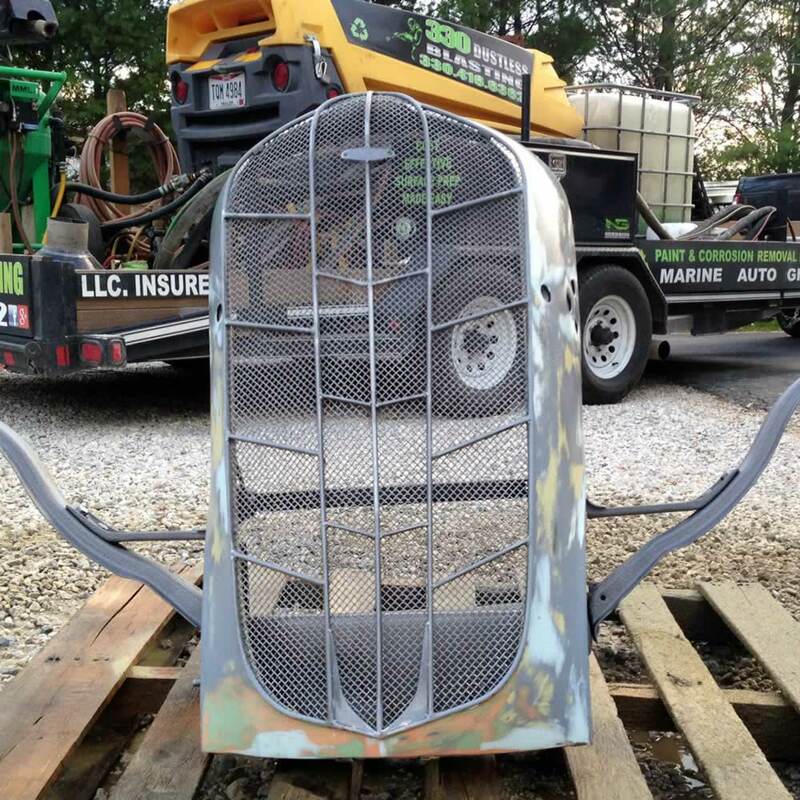 The doors, fenders, hood, and hatch were blasted followed by the body shell. 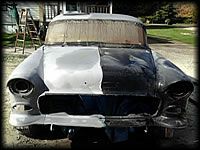 It was amazing how quickly Jeff stripped all the paint, bondo, and rust away. They came out GREAT! I highly recommend this service for working on restoring a project car. I love the results! I could have worked on it for a year and not gotten it this clean. “Jeff and his crew did excellent work at our residence in Avon Lake. Our 750 S.F. concrete driveway had been painted with oil based paint 15 years ago. He “blasted” the paint – and a clear, smooth surface resulted. While on site the crew arrived on time, worked diligently while here, and cleaned up everything afterwards. Overall, I’d say his company does good work, at reasonable prices, on time, with no aggravation, and they’re excellent to work with. 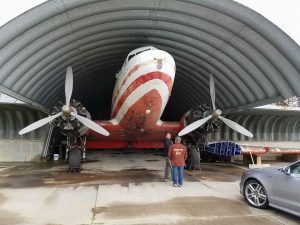 A job well done – with no complications” ~ Jim E.
Fremont Airport entrusted us with the honorable job of helping with this airplane restoration. 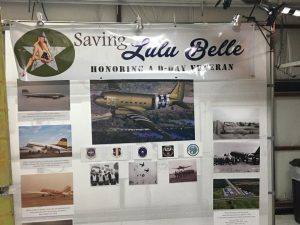 We prepared Lulu Belle – a historic DC3 World War II and D-Day veteran who carried our troops to Normandy – for repainting in her original scheme. She is scheduled to fly again in 2018! It will be great to see her finished in her Army colors and airborne. Many THANKS to our troops for their service – from before WWII to today!